Our Lady of the Annunciation chapel at Hal-Millieri restored and maintained by Din l-Art Helwa. The mediaeval chapel at Hal-Millieri near Zurrieq will celebrate its annual Lady Day festivity tomorrow in honour of the Annunciation of Our Lady. For the occasion the chapel will be open to the public between 9 a.m. and 6 p.m. Mass will be celebrated at 10 a.m. followed by the blessing of burials inside the chapel and the adjoining churchyards. Din l-Art Helwa, the volunteer heritage organisation that has held the chapel in trust since 1968, will be giving two guided tours by volunteer historians Stanley Farrugia Randon at 11 a.m. and by Salvator Mousu' at 3 p.m. 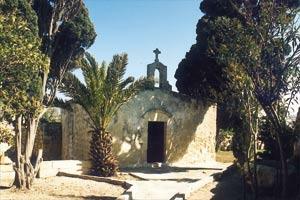 The Annunciation chapel is the most important historical monument from Malta's mediaeval past. The present edifice dates back to around 1450 and was constructed over the site of an earlier and much older chapel and parts of a late Roman rural complex. The chapel is best known for the fresco cycle adorning its side walls, between the recesses of the springing arches. The chapel was taken in trust by Din l-Art Helwa and was subsequently cleaned and rehabilitated; its frescoes, found lying under seven layers of whitewash, were expertly restored in 1975. Excavations, carried out in 1977 shed new light on the area, its surviving structures and on the inhabitants of one of Malta's lost hamlets. The chapel is open regularly on the first Sunday of the month from 9 a.m. to noon, and is best reached via Zurrieq through Imqabba Road, by taking the first right-hand side road on leaving the fountain roundabout at the entrance to Zurrieq. Entrance to the chapel and participation in the guided tours will be free of charge. However, donations collected this year will assist DLH to begin restoration on the adjoining 17th century chapel of St John the Evangelist, which lies only a few metres away from the pristine chapel of the Annunciation.